I'm so excited Fall is here! I love that each season brings different colors and weather. Here in the Pacific Northwest we usually get a lot of rain but it also makes for a lot of green and pretty views! When October hits I usually think of candy corn. I actually don't like the taste of them oddly enough, but I do enjoy their colors! Makes me think of falling leaves and the cozy warmth indoors! 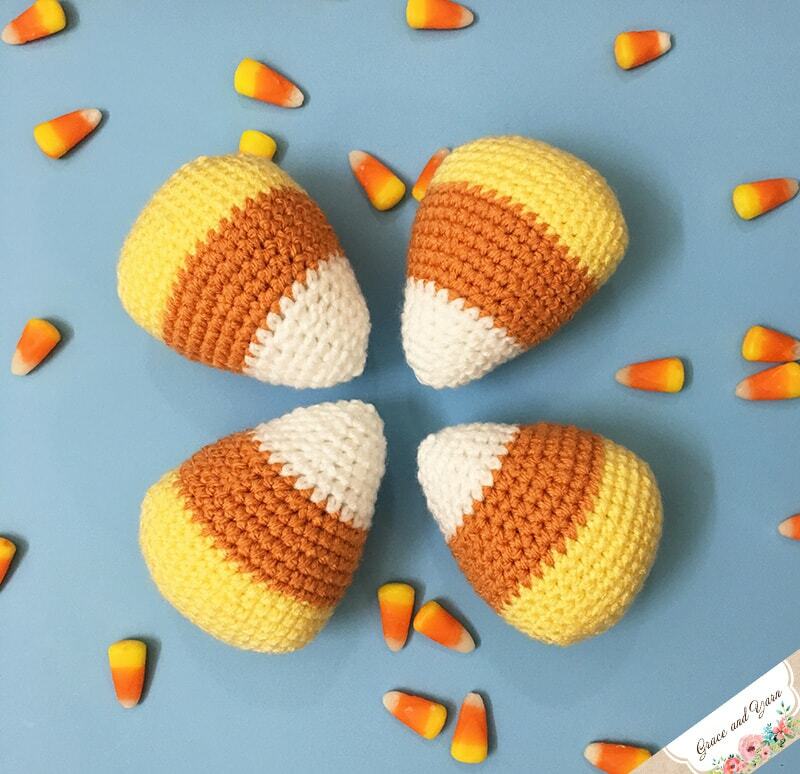 These little amigurumi candy corn stuffies work up extremely fast, can fit in your hand and the best part? No sewing involved! I made some with cute little expressions but they are also super cute just as is! You could even add a cute little bow (like this one in my mini pig pattern!) or use it to be a bow tie! If you are new to amigurumi, this is a great pattern to practice your increases and invisible decreases! 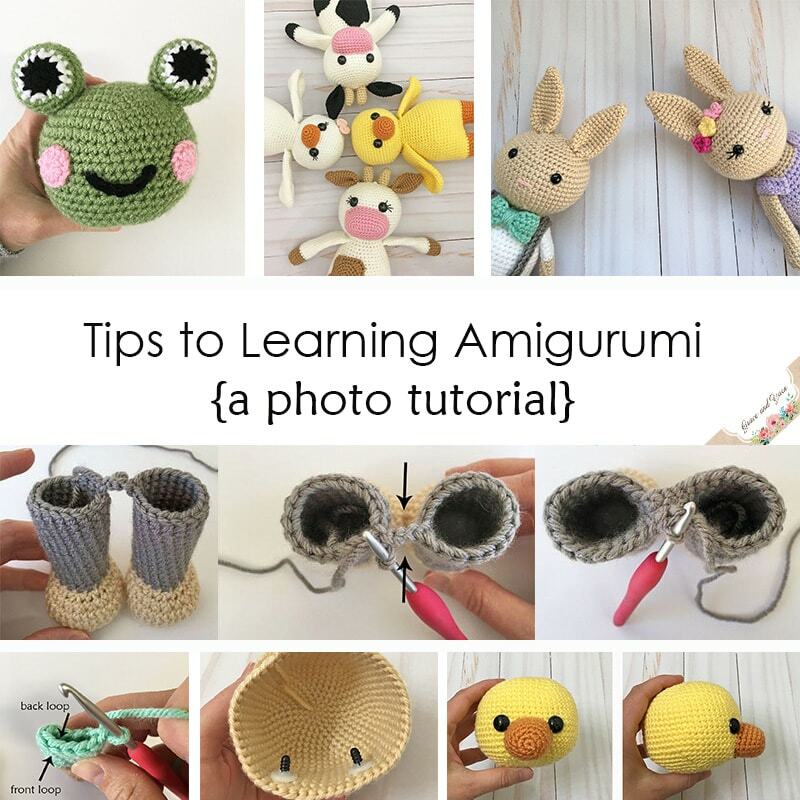 Head over to my Tips to Learning Amigurumi page for more tips and helpful photos, you'll be 'hooked'! As I mentioned above, these can also be made without the facial features! This would make a safer version for a little one under 3. If you prefer crochet eyes I have a fun tutorial for you here! Most amigurumi patterns start with a magic circle but I really wanted to keep the oval shape that candy corn has. 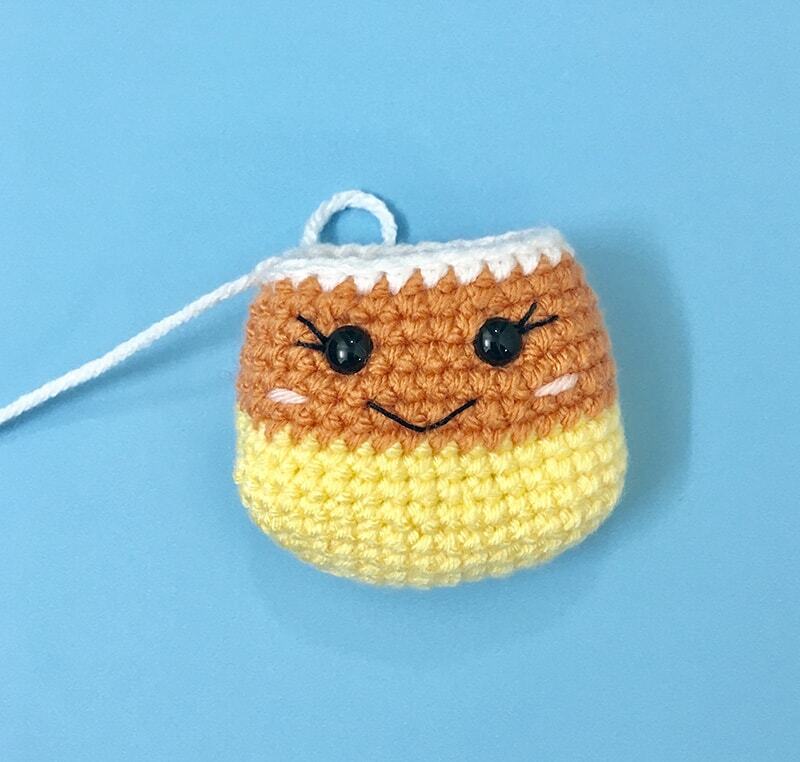 The start of this candy corn is very similar to the snout on the amigurumi cow pattern! We will work both sides of the chain to create an oval shape and that will be our base! With the oval shape it made the color changes occur at the side, which I really enjoyed! They were less noticeable and if using the invisible color change method it makes it even more seamless. I have a picture tutorial for you below if you haven't used this method before! Be sure to also join the Grace and Yarn Crochet Group on Facebook if you haven't already! You can share your work and ask any questions you have along the way! - PIN this pattern to your favorite board to save for later! - Get an ad-free printable version in my Etsy or Ravelry store! You may make and sell items made from this pattern but please do not sell, share or reproduce the actual pattern. If you sell finished items online (Etsy, etc) please provide a link to the pattern and credit to me as the designer, thank you. I hope you enjoy this pattern! Each candy corn measures about 4 inches tall. *Slowly stuff as you go, you want it to be firm but not stretched. You will be working in the round, I like using a stitch marker at the beginning of each round. 1. When completing the last stitch before your color change, insert your hook into your stitch, yarn over with the first color and pull through. 2. Drop your first color and use your new color to yarn over and finish the stitch by pulling through all loops on your hook. You now have your new color on your hook. I like to tie off my old color here as we won’t need to carry it. 3. When starting your next round, complete your first stitch as a slip stitch instead of a SC. 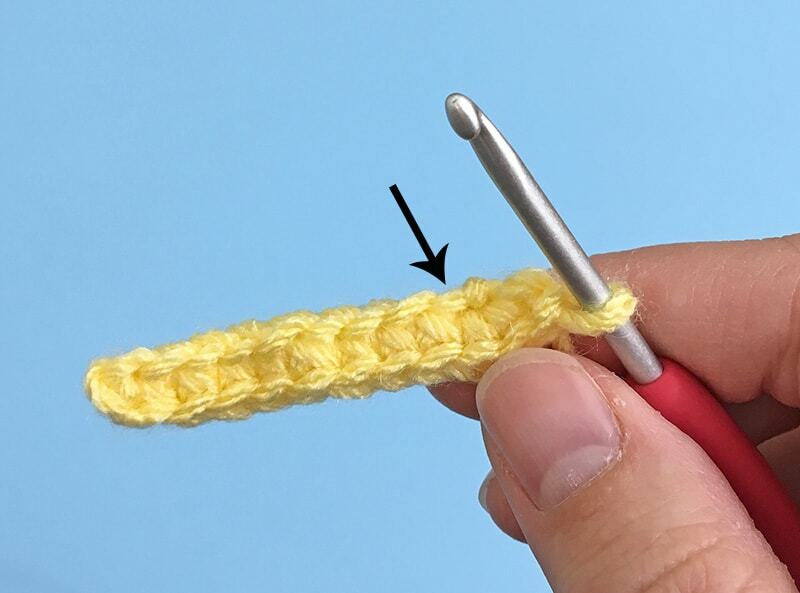 When you come back around to start your next round be sure to SC into your slip stitch just as if it were a regular stitch. Insert the eyes 4 stitches apart between rounds 12-13. Add cheeks, eyelashes, eyebrows and smile to your liking. Fasten off and sew remaining hole closed. 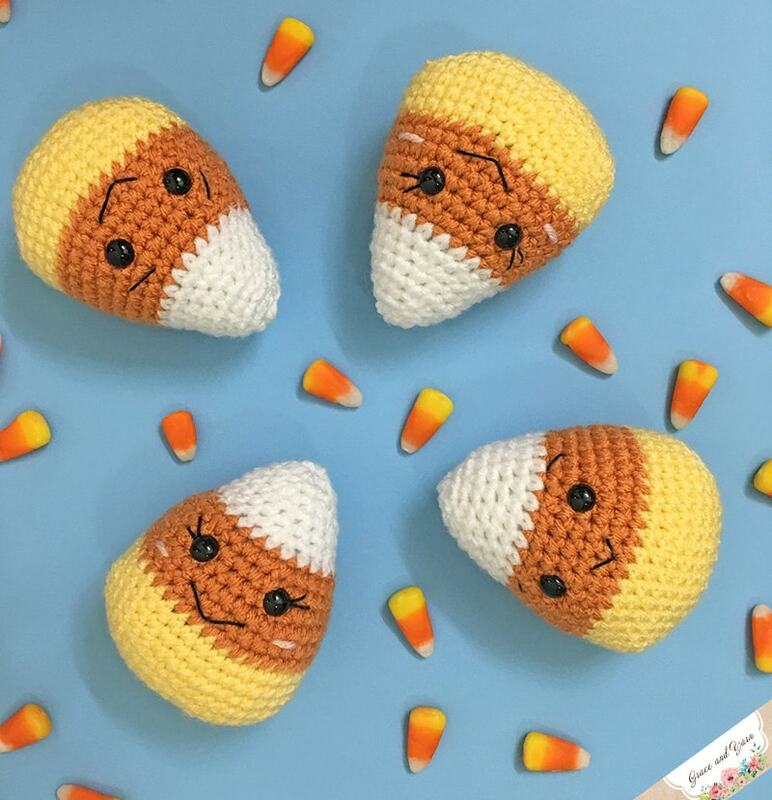 Your candy corn is now completed! I hope you have enjoyed making this pattern, please let me know if you have any questions!